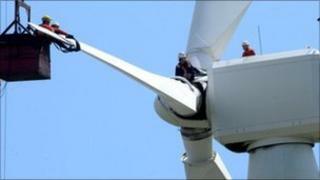 Fourteen wind turbines removed from a wind farm in Cornwall are to be used in eastern Europe, their owner says. Cornwall Light and Power has replaced the 25m (82ft) high wind turbines at Goonhilly Downs site, on the Lizard, with six 350ft (107m) high machines. It said the old turbines were due to be transported to Falmouth in January. From Falmouth, they would be shipped to Lithuania to be refurbished by a Danish company, and then sent on to Latvia to generate power there. The 14 machines were originally installed in Goonhilly in 1993 and were said to have a 20-year lifespan. The Truro-based renewable energy company said it now wanted to make sure the old machines were recycled as they were still worth tens of thousands of pounds and still had some life in them.